The Scottish Australian Mining Company, owner of the Lambton colliery, was pivotal in the establishment of three of Newcastle’s finest recreation reserves – Lambton Park, Blackbutt Reserve, and Jesmond Park. Although not officially dedicated until 1924, the Jesmond Park site had a long history of recreational use. From Lambton’s earliest days, this low-lying area at the northern extremity of the company’s mining lease, with Dark Creek running through it, was used for competitive pigeon shooting. It soon also became a popular picnic site, known as “Croudace’s Paddock” presumably because the permission of Thomas Croudace, the colliery manager, was needed to use the area. Churches, schools, and community groups regularly held picnics there, sometimes with hundreds of attendees. The site was within easy walking distance from Lambton, North Lambton and Jesmond. It became even more accessible when the Newcastle to Wallsend tramway was constructed in 1887. Around this time, the idyllic bushland nature of the picnic site was altered somewhat with the establishment of Campion’s soap and tallow works adjacent to Dark Creek. As early as 1908, Lambton Council and local residents began petitioning the Lands Department to have the area formally set aside as a public park. Their efforts were rewarded in 1923, when Frederick Croudace (son of Thomas) as manager of the colliery, gifted to the council the 22 acres of land that become Jesmond Park. Even before the park was officially acquired, the Jesmond Cricket Club was asking permission to lay a wicket, and the park soon became a popular venue for other sports such as football and soccer. A tennis court was constructed in the north-east corner of the park in 1925, and a new Jesmond Park tram stop, in line with Steel St, was opened in 1926. In 1938, control of Jesmond Park passed from Lambton Council to the newly formed Greater Newcastle Council, who maintain the park to this day. Jesmond Park in 1934, overlooking a dam on Dark Creek that provided water to Campion’s soap and tallow works. The same location in Jesmond Park, 2017. The article above was first published in the September 2017 edition of the Lambton & New Lambton Local. When the Newcastle to Wallsend tramway was first constructed, there was no tram stop at Croudace’s Paddock, however by request, trams would stop there on special occasions. By 1905 residents were petitioning to have a permanent stopping-place at the site. A new tram stopping place in line with Steel Street was opened in 1926. 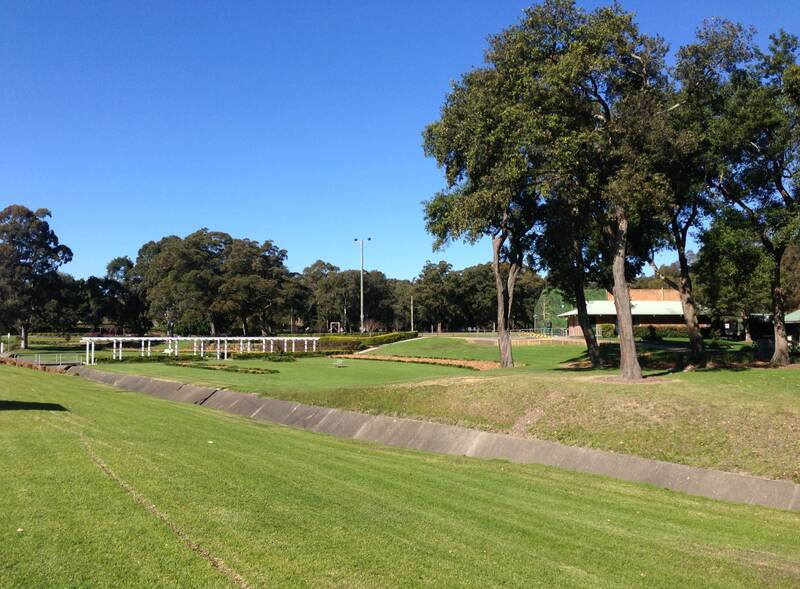 The area known as Croudace’s Paddock was larger than just the Jesmond park site, but encompassed much of the flat area adjacent to Dark Creek. A 1904 article describes the seven acre sanitary depot as being in Croudace’s Paddock. The sanitary depot was located where the Skyline drive-in theatre would later be constructed, and where Drysdale Drive and Rees Way is today. The Tennis Court opened in 1925 was situated in the north east corner of the park. Location of Jesmond Park Tennis Court. 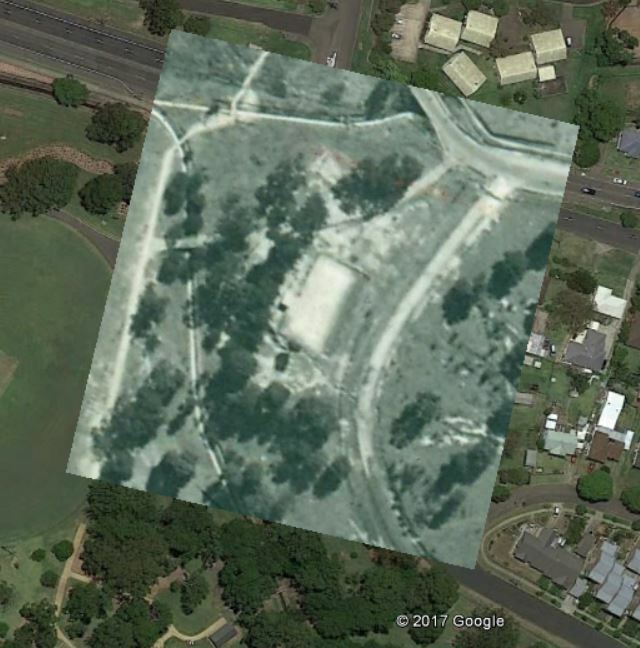 1944 aerial photograph superimposed on Google Earth. Croudace’s Paddock was occasionally used for purposes other than recreation, such as first aid classes, or military encampments. 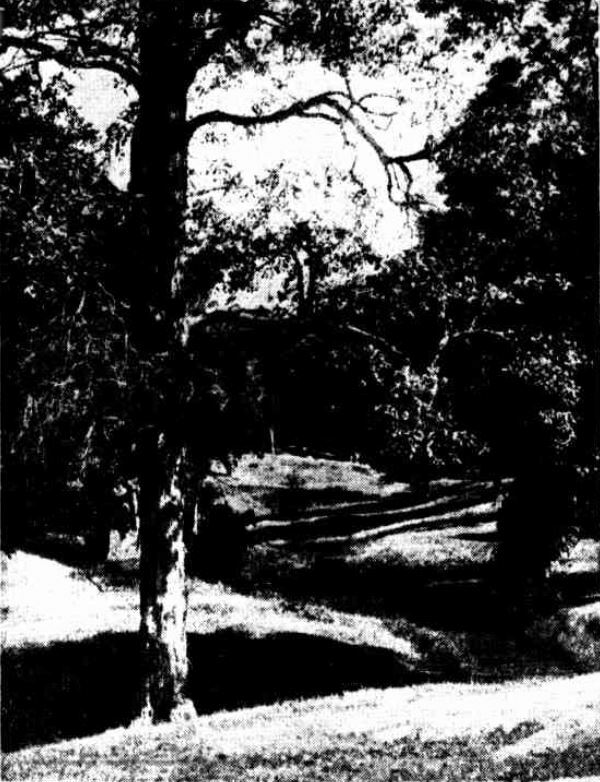 “Jesmond Park, showing the trees in profuse foliage and forming a delightful rural scene – approximately four miles from the ocean beaches.” Newcastle Morning Herald, 16 Dec 1933. According to the Jesmond Public School 1887-1987 Centenary booklet, John Campion arrived in Australia from England c1880. Around 1887 Campion began refining tallow for miner’s lamps, in partnership with his brother-in-law Ben Cunnington. The photo below, from the University of Newcastle Cultural Collections, shows Campion & Cunnington’s Soap and Tallow Works in 1892. 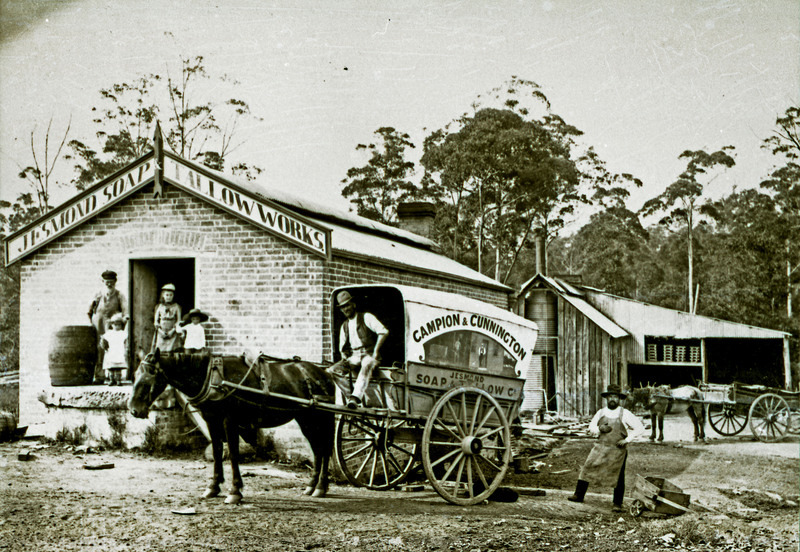 Campion and Cunnington’s Soap and Tallow Works, Jesmond, NSW, February 1892. Photo by Ralph Snowball. University of Newcastle Cultural Collections. The nature of soap manufacture meant that the works were susceptible to fire, and a number of incidents of destructive fires were recorded over the years. 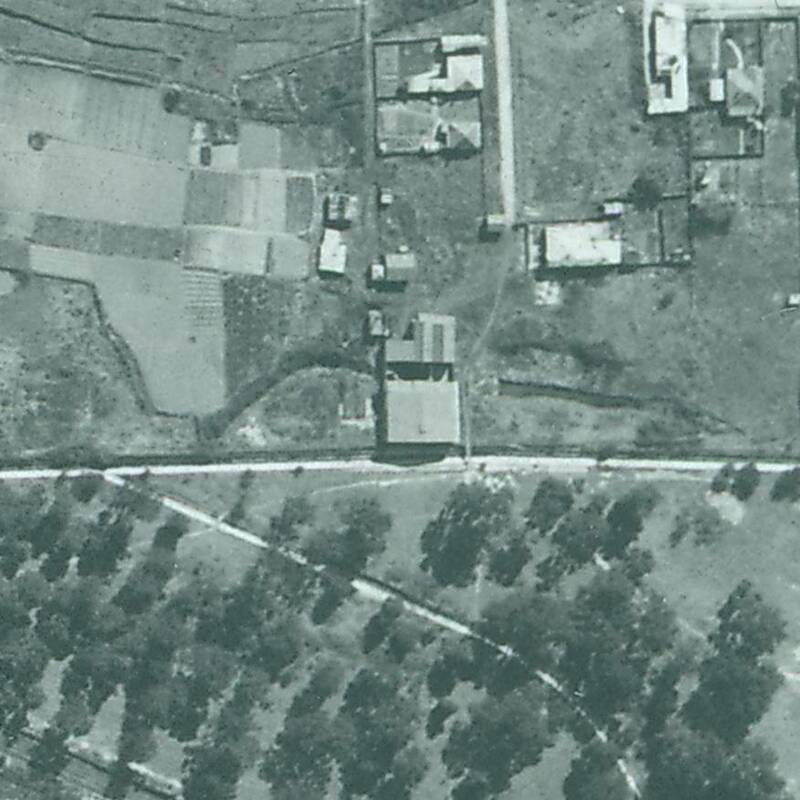 A 1944 aerial photograph shows the soap works building sitting astride the remnants of Dark Creek, just to the north of the concrete storm water drain. Just to the east of the building is the dam that appears in the 1934 newspaper photograph. Campion’s Soap and Tallow Works in 1944. 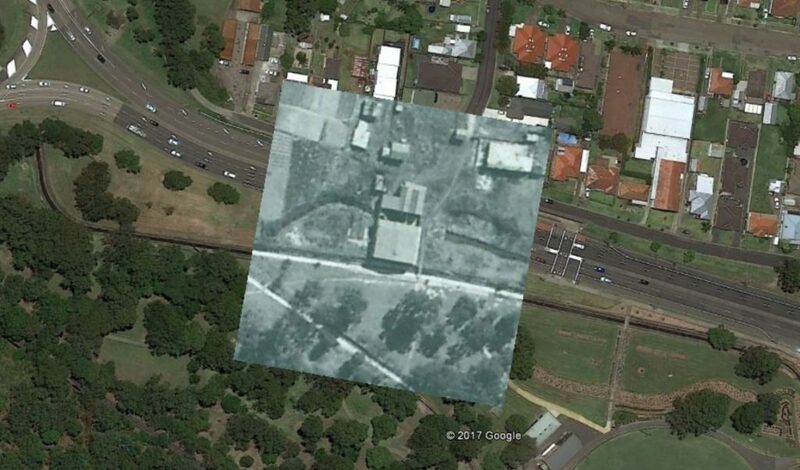 1944 aerial photograph overlay in Google Earth, showing location of Campion’s Soap Works, Jesmond NSW. 10 Jun 1871 First mention of "Croudace's Paddock" in the newspaper. Inquest into the accidental shooting death of a young lad, Charles Blim, after a pigeon shooting match. 23 Sep 1871 "A grand pigeon shooting match is to come off between two old knights of the trigger, in Mr. Croudace's paddock, at Dark Creek, on Saturday (three weeks) between Blacket Richardson and John Ferguson, for £10 aside." 11 Nov 1871 Picnic in "Croudace's Paddock" of the Lambton Band of Hope, with 300 attendees. 20 Sep 1873 Remarks on the naming of Dark Creek … "Jesmond is the correct, and more suitable name of this locality. It derives its title of Dark Creek from the men and days of thirty years ago, when the place was remarkable for its thickly, woody, and consequently shaded appearance." 6 Jun 1879 Incident of cruelty by youths towards a "native bear" (koala) at "Croudace's Paddock. 19 Oct 1895 Advertisement for the Lambton Primitive Methodist Sunday School picnic in Croudace's Paddock, advising that "the Traffic Manager having been written to, the trams will probably stop at the paddock." 23 Oct 1897 "The members of the Wallsend and Lambton Government ambulance classes assembled in Croudace's Paddock, Lambton, on Saturday, and were examined in squads by Drs. Nash and Stapleton as to their knowledge of the principles of rendering first aid to the injured." 5 May 1900 "The Newcastle, Lambton, and Wallsend companies of the 4th Infantry Regiment went into camp at Croudace's Paddock, Jesmond, last night, while it was raining heavily. It is intended to "take" Charlestown this morning." 1 Aug 1900 A fire at Mr. J. Campion's tallow refinery. 22 Oct 1902 "Croudace paddock is fast getting into favour as a holiday resort. There were no less than five parties of picnicers on the ground and the immediate vicinity yesterday." 1 Feb 1905 Residents petitioning for a tram stopping-place in Croudace's Paddock. 21 Apr 1908 The Minister for Lands rejects Lambton Council's application to have Croudace's Paddock dedicated as a public park. 4 May 1909 Jesmond Progress Committee asks Lambton Council "to approach the general manager of the S.A.M. Company, with a view of getting a grant of the land known as Croudace's paddock as a public park for Jesmond." 14 Jul 1910 Fire in Campion's Soap Works, Jesmond. 23 May 1917 The tramways department asks Lambton Council to suggest a name for the stopping place near Croudace's paddock. The Council recommends the name "Charlton", however there is no evidence that this name was ever adopted. 23 May 1917 "The Council decided to suggest that the stopping place be named Carlton Place, and recommended that the stopping be shifted a few chains easterly." 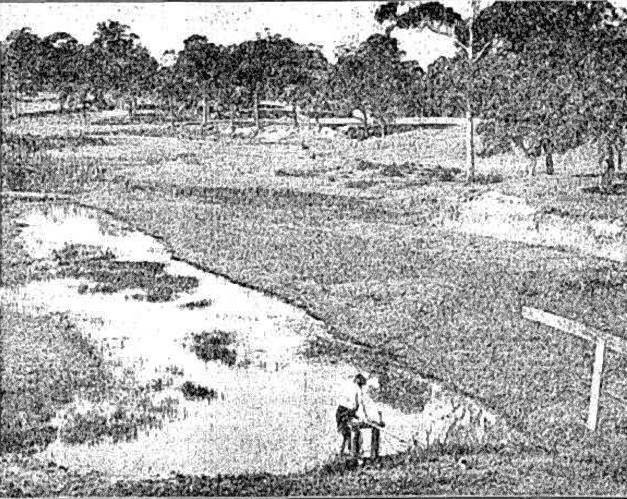 1 Aug 1919 Lambton Council asks the Lands Department to resume Croudace's paddock, Jesmond, for a recreation reserve. Alderman Bell said that "for many years the area, by permission of the S.A.M. Company, had been largely availed of for picnic purposes, and as a ground for cricket and football. The situation was on ideal one, and with very little expense it could be converted into one of the best parks in the district." 5 Oct 1920 Alderman Hardy, Mayor of Lambton, raises with the Minister of Lands the question of resuming an area of land at Jesmond, known as Croudace's paddock, for a park. "The Minister assured the Mayor that this matter had not been overlooked. The papers had been referred to the district surveyor." 22 Mar 1921 Frederick Croudace, meets with the district surveyor and a representative of the council to inspect the land known as Croudace's Paddock, for the proposed park at Jesmond. 25 Jul 1923 "The matter of the acquisition of an area approximating 22 acres of land at Jesmond had been brought to a successful conclusion by an interview with Mr. Robinson, general manager of the Scottish Australian Mining Company, who agreed to grant the land to the council for park purposes, the only obligation on the part of the council will be the survey transfer and fencing costs. The thanks of the council were due to Mr. Robinson and Mr. Croudace for the fairness and courtesy shown during the negotiations and to the company for its generous gift." 21 Aug 1923 "A. Barrie, on behalf of Jesmond Cricket Club, asked Lambton council last night for permission to lay a wicket on Jesmond park. The Mayor said that the application was premature, as the council did not yet have control of the park. It was resolved to refer the matter to the Scottish Australian Mining Com pany." 19 Feb 1924 "The S.A.M. Company had dedicated to the municipality Croudace's paddock as a public park. Efforts were made to obtain a grant from the Government to improve the area, but so far without any good result." 29 Apr 1924 Various mentions of Jesmond Park at Lambton Council meeting, including that a site for a tennis court had been decided on. 12 Sep 1925 Opening of tennis court in north east corner of Jesmond Park. 16 Feb 1926 Lambton Council to ask the tramways department to have the "tram stopping place at Jesmond Park extended in a line with Steel-street." 8 Jun 1926 "A petition was received from the residents of Jesmond, bearing 42 signatures, asking that the Jesmond loop be retained as a tram stopping place in addition to the new stop at Steel-street." 22 May 1934 Photograph of Jesmond Park, 1934. 25 Nov 1938 "Within a four-penny-tram ride of the city is Jesmond Park - a natural playground which has been saved for posterity by a council now extinct. Practically unknown by many people, the park provides ample facilities for sporting activities amid the quiet surroundings of the silent bush." 17 Mar 1948 A motion is defeated in Newcastle Council that would have seen Jesmond Park renamed to Johnson Park, in honour of Alderman J.T. Johnson, who served on Lambton Council for many years.